From screaming on the local professional soccer team (the Cape Coast Dwarfs) in the pouring rain, to meeting the former President of Ghana and Chairman of the African Union, to being pulled into the middle of an international agricultural trade deal, to traveling to the Elmina slave castle, Nzulezu, “the village on water” (a village built on stilts in the middle of the lake), and Kakum National Park where I had the opportunity to walk through the canopy of one of Africans oldest virgin rainforest – this past couple of weeks have been phenomenal! I must admit that I did not have the best first impression of Ghana, but it has grown on me immensely! Most of the people that I have interacted with are slightly shy (but certainly not all of them), but if an effort is made to get to know them they have almost all ended up being great people. The only bad incident that I have had since being here, as described in my last blog entry, has proven not to be the norm and after several discussions with others, I have learned that last year gold was found near by, and that man may have thought I was collecting samples from the lagoon to try and pillage Ghana’s gold for “white profit”. And after my experience at Elmina slave castle and learning more horrific details than I ever want to know about the trans-atlantic slave trade, apart of world history that still has many fresh scars around the costal areas of Africa, and hearing about how companies from across the planet still exploit many Africans on a daily basis for economic gain, I can understand why that man could have thought I was here for that reason. The local food, after you figure out what each dish actually is, can be quite tasty. The internet, power, and running water have all been very reliable after the first week as well. The temperature has taken some getting used to (but I think I am even starting to be comfortable with that). The next day I took an non-airconditioned bus from Cape Coast to Accra and spent the night. The next morning the Presidents assistant came to my hotel at about 9 A.M. and spent about three hours with me speaking about everything from his favorite Ghanian football (soccer) team, to current Ghanaian politics, to funny stories from some of his past jobs working at the Ghanaian embassy in Washington D.C.
At one point he received a phone call and hurriedly ran outside to take the call. I did not think much of the event, knowing how busy of a man he must be. However, a couple minutes later he came back in with another man following him. The President’s assistance then informed me that when he realized I was coming he had set up a surprise for me since he knew of my passion for agriculture and agricultural development. He then introduced the man standing behind him as Abraham Odoom, the former Deputy Minister of Agriculture for the country of Ghana. He also informed me that Abraham was in charge of the development of several of the Cocoa (Chocolate) development programs that helped Ghana become the world’s largest producer of Cocoa. In just four years, Abraham helped expand the countries output from roughly 200,000 tones to well over 750,000 tones. We had some very interesting and positive conversations for about 45 minutes before he had to leave to attend to several other business matters that day. Once we arrived at President Kufuor’s house and went through security (even though I was waved through), I was directed straight to the main living room in the house where I waited until our appointed meeting time. Since I had some time to spare I had the opportunity to look around at some of the awards and accolades that he received over the years. I was instantly like a kid in a candy shop! I saw the first 8oz. of oil found in Ghana (which happened during his Presidency and helped create an economic boom in the country), to many awards from the United Nations, African Union, various international human rights, environmental, and agricultural organizations, and even some of the gifts that he had been given when traveling (my favorite being his Zebra skin rug). 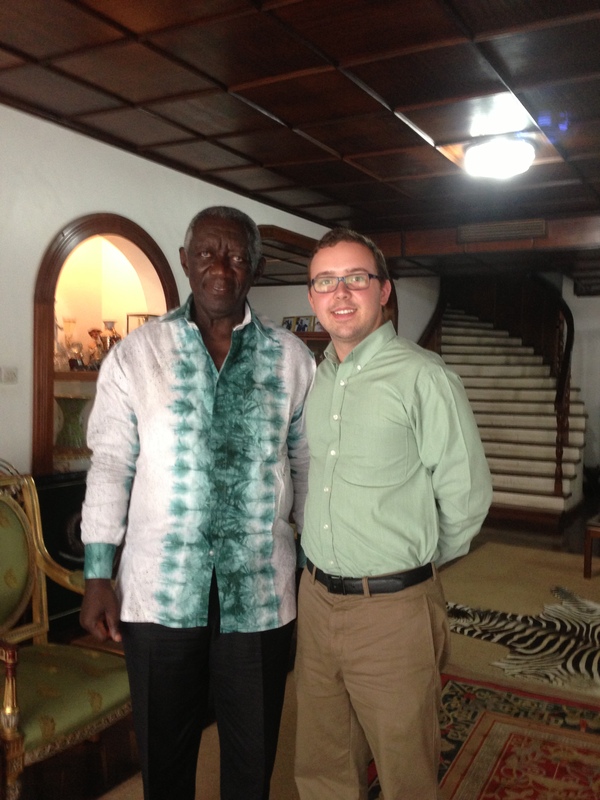 President Kufuor and Myself (in the background you can see the Zebra skin rug I was talking about). After about 45 minutes of conversation, President Kufuor offered me a job/internship with his foundation, offered to write a letter of recommendation for me for a scholarship (without me asking him), said he would try to come to Virginia Tech as a speaker for a Feed by Seed event, asked me to consider bringing Feed by Seed to Ghana, and made me promise to stay in touch. I could not have been happier! After our meeting he had one of his security guards, Sammy, drive me to the bus station. After talking for about 30 minutes we exchanged numbers and I headed back to Cape Coast, but about the time I was getting back I received both calls from Sammy and the President’s assistant to make sure I had a safe journey. Note: The description of this event and how nice everyone was has been a better description of my time in Ghana than the stories from my first blog since arriving. Nzulezu – Around 600 years ago a tribe from Mali left there homeland due to conflict and settled in western Ghana. Then, due to food insecurity, the tribe split in half. Half on the tribe stayed on land, and half built a village on stilts in the middle of the lake. Since then, the two villages have worked together to produce enough food for each other. One fishes, and the other grows crops. Yesterday we journeyed to this village (about 4 hours from Cape Coast). We left at 5 A.M. to avoid traffic and arrived a bit after 9. Then we rented canoes and paddled for about an hour through flooded rainforest with our guide before we arrived at the village. Currently, about 450 people live and work in the village doing various jobs. They have a church, school, several hostels, several small shops (about the size of a walkin closet), and even a few bars. After touring the village we were taken back to the school where we spoke to the tribal chief’s daughter (since he was visiting the land village of the same tribe). 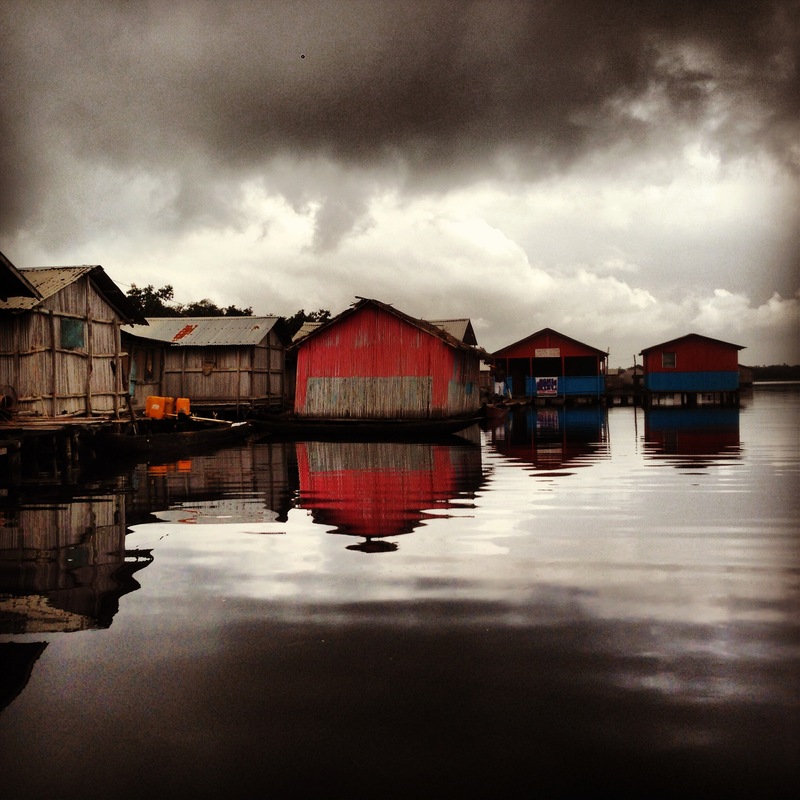 We asked her many questions about the history of Nzulezu and what life was like living in the middle of a lake. She told us that the only motorized boat they had was only used for medical emergencies and besides that no matter who you are, you had to paddle for about an hour to get to the nearest store/small town. We then left and paddled all the way back to where we started (and let me tell you the paddling thing was really starting to get to me) and headed back to Cape Coast. Kakum National Park – At Kakum National Park we had the opportunity to explore one of the few virgin rainforest in all of West Africa. 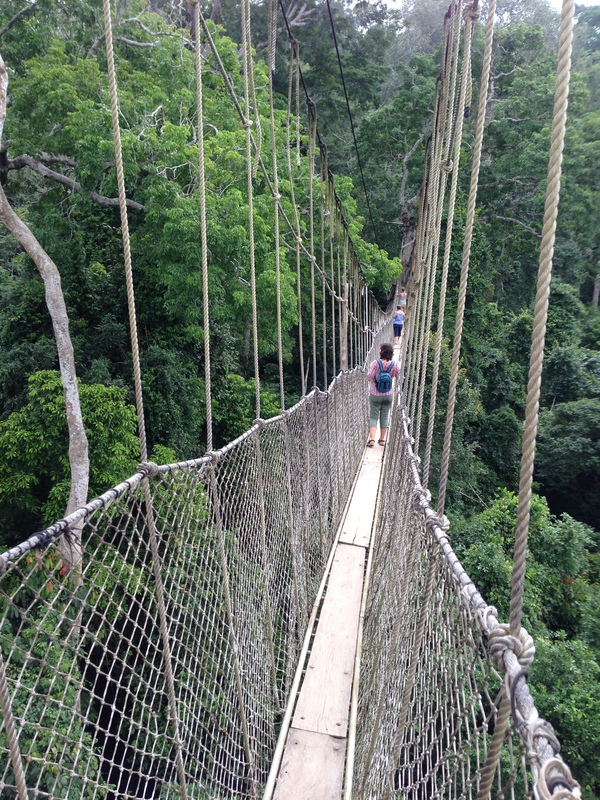 To better allow visitors to experience the whole rainforest, they have built a series of 9 huge swinging rope bridges through the canopy of part of the park. So after a long hike up the side of the mountain we were able to start our journey on the bridges where we did see several different species of birds and butterfly’s, and although elephants and other well-known African wildlife do live in the park we were told that they are rarely seen near the canopy walk because there are almost always humans there. More blogs about Elmina Slave Castle, the international agricultural trade deal, and the soccer game to come later this week! Until then, stay positive, healthy, and busy.